This year marks a new departure for the Village Zendo’s summer ango, a period of intensified study and practice. In 2018, we said a sad goodbye to the Grail, which hosted us each summer for more than 20 years. 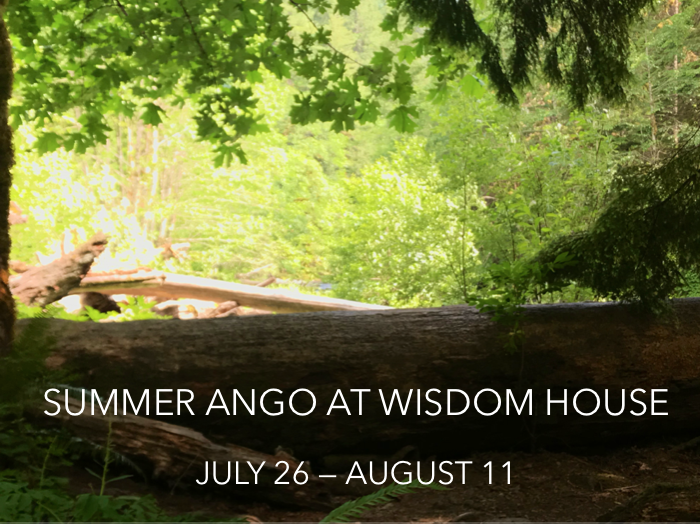 This year we’re bringing summer ango to Wisdom House, a spacious retreat center in Litchfield, Connecticut, with new programming and a revamped schedule. The first week of summer ango features Dai Sesshin, an eight-day silent meditation retreat. In addition to sitting and walking meditation, the days follow a schedule of body practice, work practice, dharma talks, informal oryoki meals, and chanting services. Private interview with Roshi Pat Enkyo O’Hara and the Village Zendo teachers is available throughout the retreat. The second week offers two programs centered on compassion and the ethical teachings of Buddhism. The first is Compassion Mind, a two-and-a-half-day interactive workshop led by Sensei Barbara Joshin O’Hara. The workshop will be followed by Karuna Sesshin, a four-day silent meditation retreat with compassion as its underlying theme. You are welcome to join us for either or both of these programs. Running concurrently during the second week will be our annual Precepts Study Group for those who wish to receive the precepts and make a formal commitment to observing the Buddhist ethical teachings. The week provides participants with an opportunity to deeply encounter the precepts and culminates in the traditional ceremony of Jukai. Summer ango brings us together in a beautiful setting to intensify and refine our practice with a group of likeminded people. Please join us for any or all of it. We have been allocated a block of single rooms which be assigned by registration date. Please register early to secure a single room. Once those fill we will be offering double rooms only. Pricing will remain the same. Dai Sesshin is an eight-day silent meditation retreat. The daily schedule includes five hours of meditation with ample time for rest and walks in the natural surroundings. There are chanting services and the opportunity to have private interview with Roshi Pat Enkyo O’Hara and the VZ teachers. The Precepts Study Group is a weeklong retreat designed for those who wish to take Jukai, a formal ceremony in which participants vow to follow the Buddhist precepts for ethical conduct. In addition to daily silent meditation, there are interactive study sessions that take place during the morning and afternoon providing an immersive and supportive environment in which to experience these teachings. The week will end in a joyful community ceremony for those formally receiving the precepts. If you are interested in taking Jukai, please contact the Village Zendo as soon as possible for arrangements and details. How does compassion arise? What place does self-compassion have in Zen practice? How does knowing our neurophysiology help when it comes to difficult emotions or challenging situations? And how can we appreciate ourselves for who we are, with all our imperfections and failings? This workshop will be experiential in nature and include writing exercises, discussion and lecture format. We will follow the ango schedule for morning and evening zazen. The program starts on Sunday evening and concludes on Wednesday morning. While the workshop is a stand-alone, attendees are encouraged do the four-day silent Karuna retreat that follows. This silent retreat is an opportunity to deepen our capacity for compassionate presence by following the sesshin schedule of morning, afternoon and evening zazen. Interview with Enkyo Roshi and the Village Zendo teachers will be offered as well as a dharma talk each day. The retreat starts on Wednesday evening and concludes on Sunday morning. Summer Ango culminates in the joyful community ceremony of Jukai in which participants in the Precepts Study Group will make a formal commitment to observe the Buddhist ethical teachings. All are welcome!